and the European Parliament voted in favour of the draft back then. Since then, the draft was discussed in non-public "trilogue"
March 2019, there will be demonstrations in more than 30 cities in Europe. I think that we as OpenStreetMap project have to become active. possibles and will have too many false positives. German Wikipedia will be turned off on that day as well. 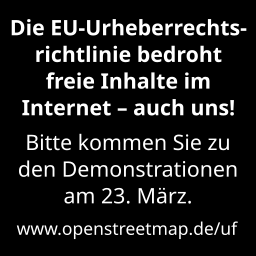 > Please join the demonstrations on 23 March. projects and www.openstreetmap.org to join to protest. maintainers of the Rails Port wanted the board to agree with it. (depens what is easier to implement). more services to reach as much mappers and data users as possible. Geofabrik will turn off download.geofabrik.de partially on 21 March.